This weekend, the Landscape Institute’s AGM in Norwich will be accompanied by a series of inspiring talks exploring the pivotal role that water has in its purer landscape form: rivers. A group of expert speakers will be sharing their experiences in dealing with rivers in various design fields and disciplines at The River Is Everywhere event. Robert Barker of Baca will be discussing the practice’s designs for The Deal Ground in East Norwich, recently granted planning permission. The Baca-led consortium of designers had to consider the site’s numerous constraints, not least the issues of flood-risk, ecology and access. He will joined by Jenny Mant of The River Restoration Centre, Eoghan Sheils of SheilsFlynn and Richard Haine of Frog Environmental. 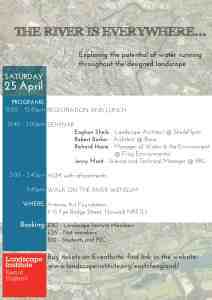 Following the seminar, Eoghan Sheils will guide a walk along the River Wensum. If you would like to attend the event, please follow the link HERE to book tickets.